How would you rate 6864 Batmobile and the Two-Face Chase? One vote has been cast since the poll was created on 21:52, 10 January 2014. This is my second Super Heroes review, the first being 6858. 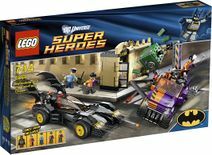 This is currently the second biggest set of the DC Universe line and features Batman with his most famous vehicle, the Batmobile, Two-Face and his new truck, and a bank. Like most of the DC sets, this is essentially a remake of an older Batman set; 7781 The Batmobile: Two-Face's Escape. Besides the bank and price point, there is one major difference you may or may not of noticed about Two-Face and the minifigures/vehicles at his disposal: The color scheme. I tried to take pictures of the box and instructions, but they didn't come out too well. On the front of the box, we have the same image as above (the one that says this set…) but against a nice blue box. There is a cartoony image of Batman up in the upper right-hand corner (wearing the Blue Super Heroes suit, not the included Black one). The DC and LEGO logos are on the other side and SUPER HEROES appears under the DC logo in large golden letters. There is a batsymbol in the lower right hand corner and a shot of the five minifigures included and a notice of the comic book in the lower lefthand. The back of the box shows features of the set against a yellow background. Unlike with the Catwoman set, I like the yellow here, I probably didn't like it there because it clashed horribly with the purple bike, where here there are many more colors than purple. There are two instruction booklets, each with the same image as the box, but without the comic book notice and such. There is not trouble to discern between black and dark gray as black pieces now have white outlines. The instructions are easy to follow, and are printed against a nice, light blue background. On every other righthand page, there are blue images of Batman, Superman, and The Joker. It's looks nice, but bugs me because Batman has the torso he had in preliminary pictures of 6858 Catwoman Catcycle City Chase and Superman has a nonexistant expression and the wrong hairpiece. Joker seems fine though. The first manual is for the Batman and the Batmobile, while the second is for Two-Face, his henchmen, and the Guard. The comic book is the same size as the two instruction manuals and seems to currently be the last of the LEGO/DC series haveing a red 5 in the lower left hand corner. The cover is a picture of Batman, Superman, and Wonder Woman standing on the rooftop with mugshots of The Joker, Catwoman, Lex Luthor, Two-Face, Poison Ivy, and Bane. The first two pages of the comic are dedicated to a story about Catwoman and Batman, which seems to be available with every other comic book and was even featured in the back of 6858's instruction manual. Then there is a page advertising all fo the current DC figures and the sets they come in. Then we get to the story about Two-Face. Simply, Two-Face and his henchmen rob the bank by using the crane arm to abduct to safe. The Guard clings to the safe, and Two-Face consults his coin and pushes the guard off (that's the last we see of him). Batman then races out of the Batcave in the Batmobile and easily defeats Two-Face. Then there is an image of The Joker planning to dispose of Batman with Two-Face, Catwoman, Poison Ivy, and Bane hunched over him. And lastly, there is a page giving sneak peeks at some of the other comics with a small panel from each of them. The set includes 531 parts for $50, which is above the "golden ratio" of 10 cents a piece, something which licnesed sets hardly ever meet. However, this set's predecessor had 386 pieces for $30. So, it's not as good as the predecessor, but that it is still pretty great! The parts are divided up into four bags-The first with Batman, half of the batmobile, and a new brick separator. Yes, a brick separator is included! The second bag has the rest of the batmobile. The third has Two-Face, his hencmen, and their truck. And lastly, the fourth features the Guard, the safe, and the bank. There is a sticker sheet included, I normally always apply mine, so I can't tell you if they detract from the set too much or not, but I'd recomend at least placing the one for the orange/purple truck's hood. I wouldn't recomend getting a set like this for parts, but that's just because I don't like getting large sets for parts myself, but it does include a fair ammount of tan and black bricks and some orange and purple. One stand out piece would be Two-Face's new coin, which is one of those printed 1x1 round plates. It is printed with the "good" side, and I hear tell that it might be representing a silver dollar with Susan B. Anthony. The printing is more distinct and the coin darker than the cropped Shop@Home photo below. Also, Two-Face's left hand is not that color. There are five minifigures included-Batman, Two-Face, two Two-Face henchmen, and the Guard. The minifigures are all superb. The variation of Batman that appeared in 7781 was my favorite version of the Batman minifigure from the Batman theme, not that I ever collected that theme. The main difference between the two now is that the updated Batman has a double sided face, backprinting, and yellow where the original had gold. There are other differences, but I don't feel like listing tiny details. I think I prefer this Batman, mostly because the smiling side of the face reminds me of Adam West, but I may be being optimistic because I have access to this one. There is one batarang included as an accessory, which is nice to have, but a little dissappointing because every set which included Batman and sold for $20 from the Batman line included three batarangs as well as a grapple gun, two grapple bataraings, and a couple guns for the villain(s). I do like this Two-Face minifigure, but there are things about the old one which I prefer. First of all, and probably most obvious, the colorscheme. Orange and purple are not color wheel opposites, so to me, they don't say split personality, whereas black and white does so perfectly. I won't take points off for it though because it's colorful, and that suits LEGO. Another thing I'm not so fond of is the eye on the scarred side. Where the old one was large and bulging, the way I'm used to, this one doesn't even have a pupil and makes it look blind to me. Another good thing about the colorscheme is it adds variation if you already own the black/white Two-Face and may be what makes this set worth it, being very different from 7881. Nit-picks aside, Two-Face is fantastic and his suit and face have much more detail than before. But still, I hope that we see him in a black/white suit sometime later. There are no weapons included for Two-Face, he only has his coin. One problem I have with the Super Heroes theme is that none of the villains carry guns for some odd reason (except for Joker's fake one). They can have them on their vehicles, but forbid they carry them. There are two hencmen included and unlike the original Batman hencmen, these two have much more personality than the triplets (look up the original henchmen from the Batman theme to explain triplet). Both of the same purple/orange jacked, gray pants, and knit cap, but the faces are unique not only between to two, but to the set. The first one has brown stubble and a scar running down the side of his face. The second has a black beard and purple sunglasses. I love his sunglasses, they add a lot of personality just because they aren't black I think. One of the hencmen has a crowbar and the other a stick of dynamite (I guess that LEGO considers those less violent than guns). I guess that this would also be the section to say that this set includes two hencmen as opposed to 7781's one. Bit of trivia about the guard, he is the only minifigure in the entire DC Universe line to reuse a head, Bruce Wayne's original one in fact. He is also wrongly accused of sharing a torso with the Detective. That is false, the guards's torso is similar to the detective's, but has a few more lines on the front and no backprinting. Oh yeah, that reminds me, he is also the only figure in the DC subtheme not to have any backprinting. The guard is armed with a pair of handcuffs and a walkie-talkie. Unlike the other minifigures in the set, he does not have a Batman counterpart, unless you count video game only minifigures (which I don't). You build the Batmobile first, and I found it interesting. I found it interesting mostly because there wasn't as much Black, gray, and yellow as I expected. Most of the black and gray covers red, blue, and white, which I guess makes it easier to keep track of bricks, and at the end, it is mostly hidden. You can still make out a couple of out of place red bricks in the cockpit (and no, not the seat) and the wheels don't cover up long red hole-bricks compltetely. Two-Face's truck was more predictable and easier to build. There weren't any advanced or unpredicted techniques used. The bank was nice to build in a vehicle/vehicle conflict set mostly because it's uncommon that it happens. Again though, nothing special. This is not a set to get for the build, but it isn't a bad one-not overly easy, but not challenging. Nothing really unexpected, but the Batmobile is rather long (see the gallery below), but I guess it has to be. Two-Face's truck fits into City scale well, as does the bank. There are no stand out playfeatures-both vehicles have two flick-fire missiles, Two-Face's truck (which only has room for two minifigures, see gallery below) also has a crane, and the bank has a blasting window (which I find dificult to reset, a removable roof would of been nice). I prefer this Batmobile to the old one, because A) this one doesn't have a cannon in the front B) It's not as long as the one from 7781. Some people have complained about the yellow wheels, personally, I don't mind them, and my biggest problem is how badly the seat peaks being 4 studs wide, rather than two, which isn't too big of a problem. Oh, and placing Batman in with his cape on may damage the cape. I like Two-Face's truck more than the last one too, except for the colors, but I can tolerate those. My biggest problem with the truck is there is only room for two minifigures, so somebody is going to have to ride on the safe. The bank is a nice touch, but not a reason to get the set for, unless you can't afford this and 3661 Bank & Money Transfer, the current City bank. Unlike the other two buildings in the DC line, the bank isn't really campy, though I think it's cheesy that the safe is on display, it may just be due to size restrictions. Like 6858 Catwoman Catcycle City Chase, this is probably the kind of set that you'd get for the figures, but even if you do, there is a great Batmobile, a nice bank, and an ugly truck (but not a bad one). I would recomend this set, it has great minifigures, is well designed, and has an above perfect (no that doesn't make sense) price per piece ratio. Facts about "6864 The Batmobile and the Two-Face Chase/Berrybrick"
This page was last edited on 15 March 2016, at 19:22.